Библиотека Пъстри халища PARIS, MOULIN ROUGE | Библиотека Пъстри халища БИБЛИОТЕКА "ПЪСТРИ ХАЛИЩА"
"Moulin Rouge" (French: Moulin Rouge, The Red Mill) is a night club, cabaret in Paris, opened on the first World Exhibition October 6, 1889. It is close to the famous red-light district, the hill and Montmartre Place Pigalle. The hall holds 850 people. Here are sung Jean Gabin, Edith Piaf, Maurice Chevalier, Yves Montand, Frank Sinatra, Liza Minnelli and others. The famous Khan-Khan, who became emblematic here is of quadrille music Offenbach. In the late 19th century Englishman Charles Morton called it French-Khan Khan and says he is "terribly noisy dance came from France." The star of "Moulin Rouge" became known mainly paintings of famous artist Henri de Toulouse-Lautrec, who from the opening cabaret comes to him every night and inspired by the beautiful dancers create their works. The lights went out, the curtain rises. The troupe of "Moulin Rouge" appears on stage in front of astonished eyes of hundreds of spectators who came to experience the magic of the iconic Parisian cabaret. To get into the hall where 100 of the most beautiful men and women dancing French Kan-Kan, happens once in a lifetime. 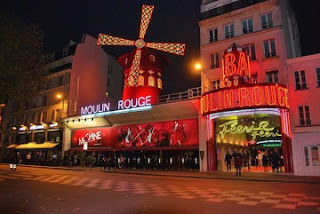 Everything in "Moulin Rouge" is brilliant - dancers, costumes, decor, menu ... Every night, 365 days a year, one of the most lavish and costly spectacles in the world runs to 850 people. Twice. The current show "Color pageant" worth € 9,000,000 - a colossal budget, thanks to a poster of the show stands for years. Only the establishment and maintenance of the costumes of the 100 dancers have spent 4 million. From concept to layout the full development of all the thousands of travel suit two years. They are completely sewn by hand embroidery is done by the best specialists in the field of haute couture. We use real feathers, pearls and precious crystals. Everything is done by hand. What is the secret of creating bootee "cancan"? Three years ago, "Moulin Rouge" buy famous studio "Klervoa" for fear it would not suspend its activities. Than half a century there making shoes for a glamorous cabaret shows. When creating a spectacle must be made seven hundred and fifty pairs of shoes every time you engage a new dancer, need to order new shoes for her. Being part of the continuous show "Moulin Rouge" is not so accessible. Minimum height of the dancers in the famous cabaret is 1.72 meters. And as an exception only if its really good. "I prefer girls to have higher 1.75 or 1.80 m for boys minimum is 1,85 m. But growth is not everything. Special attention is paid to the physique, the silhouette, especially the length of the legs. Long legs better wear costumes. Over 240,000 bottles of champagne are opened in the year. Many visitors to save the symbol of Paris for a long time to be able to afford a night of hot passion cabaret. Dinner followed by grandoznoto show "Color pageant", starting from 150 euros per person upwards depending on the menu. Plateaus have many different names as Art "Lautrec Menu", "Menu French kan-kan," etc. For banquet customer care 120 waiters and 25 cooks. Priduzheno eating is a sophisticated champagne and a wide selection of mature wines. Cabarete is the largest private buyer of champagne in the world. In the cellar he kept true wealth. Per year in restaurant drink 240,000 bottles of champagne every night cooling in 700 silver shampaniers. "Moulin Rouge" is the center of Paris and the global elite. More than 120 years, millions of spectators witnessed the magic of "Moulin Rouge". Ella Fitzgerald, Ray Charles, Elton John, Edith Piaf, Yves Montand, and many other world celebrities have sung on stage the most famous cabaret in the world. But how it all started? "Moulin Rouge" opened on 6 October 1889 Founding of the cabaret are Zidler and Joseph Charles Oler, creator of iconic concert hall in Paris 'Olympia.' From the outset, the Parisian Bohemia runs down there every night, attracted by the splendor and extravagance of the performances. Under the dome and wings of the mill show mixes circus, theater, dance. This is the beginning of the musical. The artist Henri de Toulouse-Lautrec, one of the regular customers "red mill" perpetuates violent nights in numerous portraits of cabaret dancers. His favorite is La Gulyu that every night waving his foot in the frenetic rhythm of French Cannes-Cannes. In 1915 fire destroyed "Moulin Rouge" to the ground. Later he built the new hall, in which singing and dancing Mistanget legendary. In the sixties with the advent of Hugh baletmaystorkata Doris "Moulin Rouge" became a real cabaret. "Doris Girls" as they call them today and begin to provide more lavish productions. One of their fans and Queen Elizabeth II.